PLEASE NOTE: This webpage is not up-to-date! This year the Spanish Air Force intends to organise the best air show ever in the history of the country. 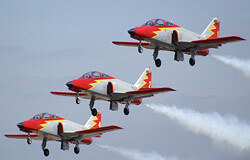 Murcia will be the venue for the event and, more precisely, San Javier AB, home base of Patrulla Aguila, expects to welcome aircraft from fourteen different countries. On the 3rd of June the San Javier air base will host a Media & Spottersday, more information about these can be found on the official website, that be launched in the near future. 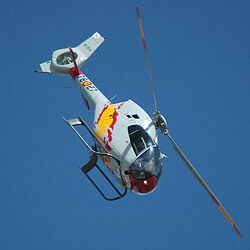 The theme of this show is the celebration of the 20 Year Anniversary of the Spanish Demo team Patrulla Aguila. Therefore many display teams from around the world are invited. As well as some special participants, as the cherry on the cake. As of now, the Patrouille de France, Patrouille Suisse and the Flying Bulls team have confirmed to particpate in this large airshow. Also many aircraft types of the Spanish air force as well as the Spanish Navy Harrier will give a flying display along the beaches of "La Ribera" and "Lo Pagan" in Murcia. This preview is written & maintained by Ramon van Opdorp.